As part of its mission, T.wai equips officials, executives and professionals with essential skills to make broader sense of the ongoing political, economic and social transformations in the international order, through high-level training, scenario-making exercises, and strategic simulations. Designed to acquire and immediately activate knowledge, scenario-making techniques are rarely employed in synergy with the insights offered by academic research. 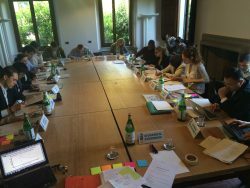 T.wai’s experts – each affiliated with a leading university – have since 2013 led customized exercises with officials from the Italian Ministry of Foreign Affairs, the Presidency of the Council, the Bank of Italy, ENI and SACE.